This book helps you get the coaching secrets of a volleyball legend. Anyone wishing to be a successful volleyball coach needs to know more than just how to teach the basic skills and implement a plan. In such a fast-paced game, not only do you need to outperform your opponent, but you must out think him as well. Volleyball Hall of Fame coach Mike Hebert spent years learning the secrets to success and among the most important is that you should never stop learning. In Thinking Volleyball, he goes beyond the development of motor skills to provide a unique cerebral look at how athletes learn. Hebert also introduces the strategies behind his reading defence approach, which will give a team an advantage against any opponent. Regardless of how talented players are, a positive environment that includes a solid mutual trust among everyone involved with the programme is a vital component for any coaching programme both on and off the court. Chapter 1. Learning and Decision-Making; Chapter 2. Structuring and Running the Program; Chapter 3. Embracing a Playing Style; Chapter 4. Honing Vital Volleyball Skills; Chapter 5. Thinking About Team Defense; Chapter 6. Drawing a Blueprint for Offense; Chapter 7. Promoting a Positive Gym Culture; Chapter 8. Strengthening Team Trust; Chapter 9. Coaching the Match; Chapter 10. Thinking Outside the Box. 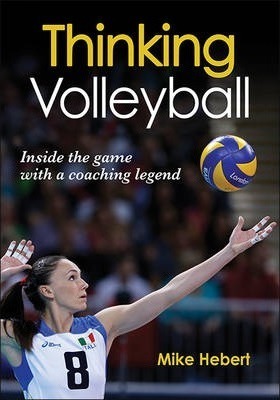 "Thinking Volleyball is a must-read. Coaches will benefit from Mike Hebert's years of experience and success in building programs at every level." "Behind Coach Mike Hebert's well-crafted words shines his three-decade quest to help his teams become great problem solvers. If you want to improve your team, you need to read this book. " "In Thinking Volleyball, Mike Hebert draws on his vast experience with and knowledge of the game to provide valuable insights into the nuances of this profession. Not only is it a great read but, more importantly, it's a great resource for coaches at any level." "Starting with the Introduction, you realize that Thinking Volleyball is a different type of book than what has been written before. The intricate weave between systems of play, program culture, and the writer's mastery of storytelling quickly bring the reader to the realization that there is nothing out there on the market like this book. Legendary coach Mike Hebert has the reader asking themselves critical questions right from the beginning of Chapter 1: Learning and Decision Making. The next chapter, Structuring and Running the Program, is packed full of ideas about topics such as team policy, program goals, and event management. In this chapter, Mike tells a great inspirational story about one of his former players and starting Olympic setter, Lindsey Berg. Over the next few chapters, the book takes a close look at different styles of play and the skills of international teams. In his discussion of the international game, Coach Hebert not only takes you on an exploration of the X's and O's of teams from around the world, but also makes observations of what he believes are the psychological principles of these teams. "The coach must decide to impose his will on the team. It is a matter of forcing players out of their comfort zone on a daily basis." This reminder to coaches is in his chapter on defense. He gets the reader to not only think about defensive technique and positioning principles, but also about reading the opposing team's offense and maximizing defensive effort. The next chapter, Drawing a Blueprint for Offense, takes an in-depth look at running an offense and the differences between an in-system offense, out-of-system offense, and counterattacking. The next two chapters, Promoting a Positive Gym Culture and Strengthening Team Trust are where I think this book separates itself from the many other books written on volleyball. As an observing and opposing coach, these are also the areas in which I thought Coach Hebert excelled with his championship-level teams. Amongst the many topics examined in these chapters are: getting teams to compete, working with and keeping injured players engaged, and developing a communication system. He writes, "The absolute most important enabler in team sportss is team-wide, unconditional trust. It is the lynch pin that holds a team together." Mike takes the reader into his team meetings and the activities he did with his teams in order to build team trust, including role playing, showing movie clips, and team readings. He also discusses how to promote development of positive self-talk and learned optimism, as well as how teams should deal with conflict. These two chapters are phenomenal, and they alone are worth the cost of the book. The book doesn't slow down one bit in the last two chapters, Coaching the Match and Thinking Outside the Box. These chapters include a potpourri of tidbits that will get every coach thinking as the reader gets closer to the end. I absolutely loved this book. Thinking Volleyball is a book that every coach at every level should have on his or her bookshelf. Coach Hebert's storytelling will keep you engaged. His layered and full 360 degree look at our profession will certainly have you referring back to chapters as you continue your journey in this wonderful sport." "Others that have written analysis have not come as close to the essence of coaching women's volleyball as Mike has in Thinking Volleyball. The chapters on gym culture and trust are remarkable. Unlike other volleyball coaching books of its kind, it digs far deeper, and comes very close to the heart of coaching excellence. For those who can soak in its essence, it will make a difference long into their futures." Mike Hebert began coaching in 1976. During his career, he coached the University of Pittsburgh men's and women's teams, the University of New Mexico women's team, the University of Illinois women's team, and the University of Minnesota women's team. In 35 years of coaching, Mike earned a career record of 952-392 and led teams to the Division I Final Four on five occasions. Hebert was on USA Volleyball's coaching staff for over 30 years and was honoured with their All-Time Great Volleyball Coaches Award.